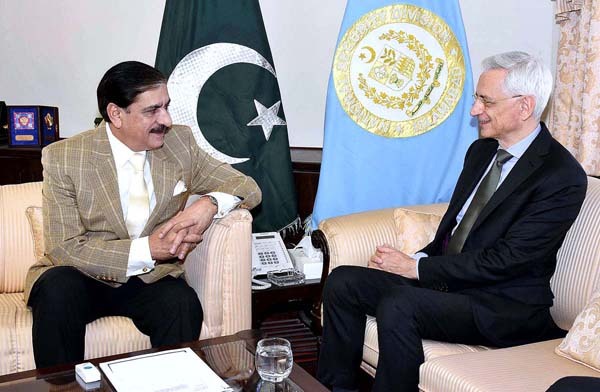 ISLAMABAD, Mar 30 (APP):French Ambassador to Pakistan, Marc Barety, Friday called on National Security Adviser (NSA) Lt. General (R) Nasser Khan Janjua and discussed matters pertaining to bilateral cooperation and regional security situation. NSA warmly received the guest and said that France was a great country with positive outlook. The envoy applauded Pakistan’s efforts against terrorism and acknowledged civil and military sacrifices offered by the nation in this regard. He expressed desire to have long-term cooperation with Pakistan in this war against terror. He also highlighted the importance of collective efforts against terrorism and said that France was willing to strengthen defence and intelligence cooperation in a comprehensive framework. Both sides recognized that the threat of terrorism and particularly Daesh was not yet over and efforts were required to effectively curb this menace in the region. NSA’s opinion was sought on Pak-India relations and on Afghan peace prospects. NSA reiterated that Pakistan was willing to have friendly ties with all neighbouring countries. “India, by refusing dialogues, has defeated the spirit of bilateralism. And this will not lead us anywhere. Irrespective of prevailing impasse, both the countries can not escape dialogue and resolution of their disputes,” he said. All mature nations sought to resolve their issues by way of dialogue and Pakistan would always insisted upon it while maintaining its National dignity and honour, he added. While discussing situation in Afghanistan, NSA termed the recent peace offered by President Ghani as an opportunity to end the perpetual conflict in Afghanistan and stressed that all the stakeholders should play a role in seeking peace there. “This again should not be put on Pakistan alone. Everyone and particularly regional countries must come forward to help seek peace in Afghanistan” he added.